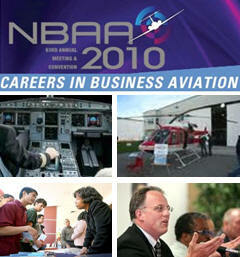 October 14, 2010 - Nearly three dozen companies exhibiting at NBAA’s 63rd Annual Meeting & Convention (NBAA2010) in Atlanta, GA are participating in a free Careers in Business Aviation Day for Georgia middle, high school and college students on Thursday, October 21. “Every Exhibitor we’ve talked to is excited to get involved,” said Mitch Young, vice president of United States Aviation Underwriters, career day coordinator for the NBAA2010 Local Committee. Companies representing every side of the business aviation industry will make presentations to students on the Exhibit Floor and discuss scholarships, internships and career opportunities available to them. Among the Exhibitors participating are fixed base operator Signature Flight Support; aeronautical charting and navigation services company Jeppesen; news magazine Aviation International News; charter operator Pentastar; the FAA; and original equipment manufacturers Cessna, Dassault Falcon, Gulfstream, Hawker Beechcraft, Piaggio Aero, Boeing and Pilatus. Students will speak not just with pilots, but aeronautical engineers, aviation insurers and attorneys, salespeople, educators, industry analysts and scheduler/dispatchers. Several Exhibitors have made their chief executives available to the students. Boeing Business Jets president Steven Taylor and Universal Weather and Aviation CEO Ralph Vasami will both speak with students at their companies’ booths. Students will then join a team of volunteer marshals, who will move with them around the Exhibit floor to speak with participating Exhibitors. Many of the Atlanta-based companies represented on the Local Committee are sending teams of volunteers to the event and several volunteer marshals will be current students at Embry-Riddle Aeronautical University. The Local Committee hopes to have 200 students registered for the career day and NBAA has launched a Facebook page to get students excited about the event. The Local Committee has also reached out to youth organizations such as the Civil Air Patrol, U.S. military ROTC groups, the Boy Scouts Aviation Explorer Program and the Girl Scouts. The committee has heard from many students who are eager to participate. “I met a young man working towards his Eagle Scout rank who was very interested in aeronautics,” said Young, an Eagle Scout himself who often joins review boards for the scouting rank. “He wasn’t interested in flying; he said, ‘I just want to design aircraft. I think that’s cool.’ So of course I recommended he come to our career day and speak to some of the engineers at the manufacturing companies exhibiting at NBAA2010. He seemed interested so I directed him to the Facebook page. I hope dozens like him show up and get excited about the opportunities in this industry.” Learn more about NBAA's Careers in Business Aviation Day at the Careers in Business Aviation Day Facebook page. Date: Thursday, October 21, 2010, Hours: 9:00 am – 4:00 pm, Location: Georgia World Congress Center, Atlanta, GA, Admission Price: Free to students, educators and chaperones.